Today’s review is about as easy as it gets. Pawley’s Front Porch needs little introduction to most locals. Food Network’s Diner’s, Drive-In’s, and Dives somewhat immortalized the Five Points location two years ago as Columbia’s go-to place for foodies venturing into the midlands, though whether or not they were quite ready to handle such a load is another question. Soon after their rise to stardom, however, they launched their mobile eats food truck, spreading their SC island burgers across the city. 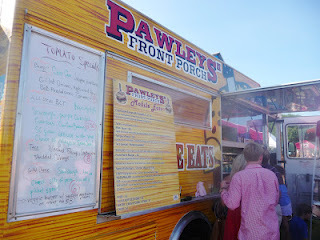 In many ways, I think the truck may be the best way to get a bite of Pawleys; though the main restaurants sweet potato fries and larger list of burgers and tacos are tempting, the truck itself has been known to crank out their very best burgers fast and quick, delivering the amazing bites that were promised from their television appearance, consistently hot and loaded the way they were meant to be. Read the rest of the Foraging Foodie’s post here! A Hungry Student on the Prowl for the Best Eats in Columbia, SC, Greenville, NC, and everything in between and beyond.